"We met Steve Palmer and the ZeeStore at the IFA in spring 2006, when we were looking for a vendor to supply our franchise merchandise. We were immediately struck by Steve's professionalism, knowledge and experience. As we moved forward to work with Steve to set up an online store for our franchise system, every part of the process has been seamless. Steve and his team listened to our needs and provided us with many solutions to meet those needs. Inventory was decided upon, items were proofed and the zee store was stocked, all while Steve built a custom online store for Young Rembrandts. Steve and his team are very hands on and through in all parts merchandising and store details. Steve is very committed to each store being successful and brings a wealth of branding and retail knowledge to the table. I really feel like we have gotten additional value in this relationship with Steve's level of brand and marketing knowledge. He is very committed to the store being a success and to helping build the company brand and brand understanding amongst franchisees. Steve recently attended our franchise conference and won over our franchisees with his impressive presentation on branding and the Young Rembrandts online store. Steve and his team are a pleasure to work with and deliver all and more than they promise." 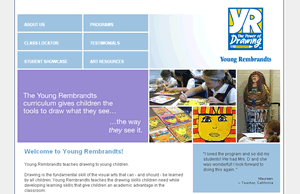 "Steve recently attended our franchise conference and won over our franchisees with his impressive presentation on branding and the Young Rembrandts online store. He and his team are a pleasure to work with and deliver all and more than they promise."